Classic movies are not just antiquated films from a bygone era...rather, they are beautiful, well-acted, well-written gems that ought not to fade into obscurity. Truly, Hollywood just doesn't make 'em like they used to!!! I hope you'll discover some must-sees by your visit here. It is with pleasure and excitement that I announce They Don't Make 'Em Like They Used To will soon be hosting its first-ever blogathon. 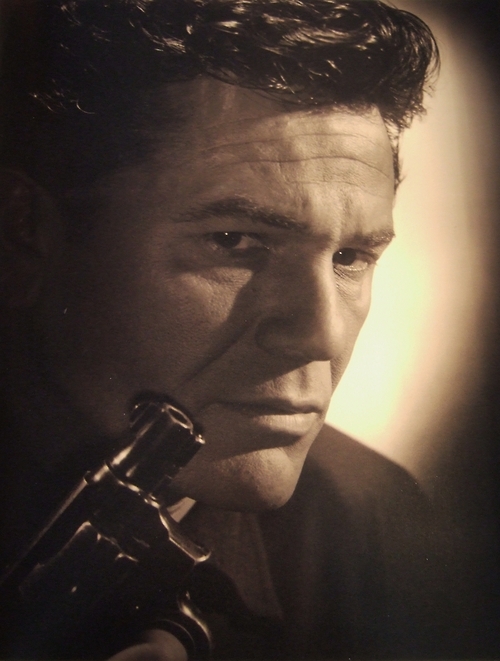 As regular readers of this blog already know, John Garfield is one of my absolute favorite actors (one of my "beloveds"), and with March 4th being the 100th anniversary of his birth, I thought a blogathon in his honor would be the perfect way to celebrate. The blogathon will be taking place that entire weekend---Friday to Monday, March 1st through March 4th. I would like to see huge participation in the event---Mr. Garfield deserves that! Besides being a brilliant actor, with the shameful treatment he received in Hollywood upon his refusal to "name names" in the HUAC hearings, I believe it is right and fitting that in some small way, we seek to make it up to him by singing his praises and giving him a portion of the honor and respect due him. Any and all of you are welcome to participate in the blogathon. Whether you want to write about one of Mr. Garfield's films, his stage career, his "method" acting, his Hollywood blacklisting, or any other facet of the talented man's too-short life, you are invited to join in the 100th birthday celebration. (You may contribute more than one article if you are so inclined.) The more participants, the merrier, so please grab one of these fantastic buttons (which my dear friend, Monty, of All Good Things graciously created for me) and spread the word about the bash They Don't Make 'Em Like They Used To is throwing for John Garfield's 100th birthday. (When you add the button to your blog, be sure it links to this page---not the main page of my blog---as this is where all future blogathon information will be posted.) Since I don't have an extremely high-traffic blog, if, in addition to adding the button to your page, some of you would like to spread the word via a blog post, feel free to go ahead and do so. More details will be forthcoming, as will directions for posting your article(s) to the blogathon. For now, though, just let me know if you intend to be part of the fun and what aspect of Mr. Garfield's career or life you'd like to write about. Then, put the dates on your calendar, spread the word, and get ready to honor the amazingly talented, tremendously under-appreciated John Garfield on his 100th birthday. NOTE: To access all the blogathon entries, go HERE. Patti, I will put on my thinking cap and come up with something for you. Thanks, Dawn, for being willing to participate...and for putting the banner on your blog. I am so thrilled that you want to participate in this. By all means, focus on Postman. It's a great film, and I will enjoy reading your take on it. This finally forces me to open my copy of Gentleman's Agreement! Would love to review that film. Thanks for stopping by, Kristen, and for wanting to take part in the blogathon. I'm thrilled to have you participate, and I think Gentleman's Agreement will be an awesome film for you to review. Given its message, I think it is, perhaps, the most important film of John Garfield's career. How cool, Patti! I will try to watch and write something up for this, definitely. Thanks, Deb. I am thrilled you want to participate! Let me know what film you ultimately decide on. I'm okay with 2 people doing the same movie, since we all see things from different perspectives and have different blog audiences, but I want to be sure that we have several films represented and that everyone isn't doing the same 2 or 3 movies. I would like to do "The Fallen Sparrow." Awesome choice, Deb! I caught "The Fallen Sparrow" for the first time back in the late summer. What a great film! You know how little I was blogging in the late summer and through the fall, so I never got around to writing a review of it. I definitely look forward to reading yours. Great blogathon idea! I'm looking forward to reading the entries. I didn't realize it'll soon be the 100th anniversary of his birth. There are a few 100th birthdays this year...Loretta Young, Danny Kaye, John Garfield, and Stewart Granger. There are probably others, but those are the ones I know. Makes a great reason to celebrate! Hi, Patti! Just came across your blog and I really want to join you in this blogathon! I'll have to think about a topic and maybe look for any other John Garfield movie, because I only watched Force of Evil. It's nice to meet you, Le. Thanks for stopping by and for participating in the blogathon. Let me know what you ultimately decide to write about. Another participant really wants to do "Force of Evil," and since you're unsure about it, I gave him the go-ahead. Hi Patti, I've got a post all ready - focasing on his life and career highlights and some quotes. I hope it goes well for you hosting your first blogathon. This will be a first for me too. Alyssa, thanks so much for joining in. I know that is going to be a very busy time for you, with your sister's wedding, so good for you for being ahead of the game and already having your post prepared. All you will have to do is post it on your blog on one of the 4 days of the blogathon (and if that is in the midst of the wedding busyness, you can even pre-date it now, and it will automatically post on the date you choose.) Then, I will add the link to your post to my daily blogathon page. Make sense? Thanks Patti, I thought I'd do my post on the Friday cause my sister's wedding is on the Sunday. I'd love to do Force of Evil but if someone's already grabbed it I'll tackle We Were Strangers. Ivan, it's nice to meet you. I'm thrilled to have you take part in the blogathon, and you may choose either of the films you mentioned. One other person mentioned having seen "Force of Evil," but she didn't commit to doing that movie and is, in fact, going to look for another Garfield film. So, if that is the one you want to do, by all means go for it. Also, since I am running the blogathon for 4 days, if you want to do more than 1 article, you are free to do so. After all, the more entries in the blogathon, the more honor and love lavished on the very deserving Mr. Garfield. Just let me know what you decide. Then Force of Evil it is. (And if time permits, We Were Strangers.) Thanks for hosting the blogathon, Patti -- Garfield is truly one of my favorites! Hi Patti! I think a John Garfield blogathon is a great idea and I'd like to join in the fun if I may. I don't have a lot of Garfield films at my disposal, but I do have a copy of Howard Hawks' AIR FORCE, so would be glad to do a post talking about that. Jeff, thank you so much for stopping by and for wanting to take part in the John Garfield blogathon. I'm thrilled to have one more person ready and willing to showcase the films of that very talented man. Absolutely, your contribution may be "Air Force." No one has "claimed" that film, so it's yours. Great choice! I look forward to reading your entry. Patti, as another Garfield fan I'd love to take part and I will spread the word about your blogathon during the next few days. I'd like to write about 'He Ran All the Way' if that is ok with you. Judy, thanks so much for stopping by and for signing up to take part in the John Garfield blogathon. Since I think Mr. Garfield more than deserves honor and recognition, I am always thrilled to discover one more person wanting to get involved in the blogathon. By all means, you may write about "He Ran All the Way." That is such a terrific film...sadly, his last. I will look forward to reading your entry. Patti, I just responded to you on the CMBA FB page, however I thought I would repeat it here. I will take on OUT OF THE FOG. Ooh, Garfield's most evil role! I quite enjoy that movie and will look forward to reading your take on it. Thanks so much for participating. I would like to try my hand at "Castle on the Hudson"
Thanks so much for participating, Flick Chick. "Castle on the Hudson" is yours...I look forward to reading your review of it. Hello. I was just reading about your blogathon and eould love to participate. Is anyone doing Four Daughters? I fell in love with the series last year. Jenna, yes, absolutely, you can do "Four Daughters." It is a great series, though I must admit I haven't seen "Four Mothers." The first 2 are delightful, and, of course, "Four Daughters' was the film which showed that Mr. Garfield was very capable of making the move from stage to screen. I love him in that movie. Hi Patti, I was reading about your blogathon and it sounds like a great way to celebrate Garfield. I was wondering if I could snag Nobody Lives Forever? If that one's already been taken, I'd also be glad to do The Sea Wolf. Aubyn Eli, thanks so much for wanting to take part in the blogathon. "Nobody Lives Forever" has not already been snagged, so it is yours! Hello...there is no bigger John Garfield fan than me! !..I have many books and all his movies on tape...I never tire of his movies...what a rare talent he was. TCM really isint doing Garfield justice on his 100th birthday, only playing 6 of his movies, Danny Kaye recently had an entire day of his movies on his 100th birthday salute. For some reason Garfield is a forgotten star, he died young and people just dont know who he is especially the modern audiences. He needs to be re-discovered. Thanks for having this blogathon...for one of the all time great actors...JOHN GARFIELD!!! Anonymous, it's always wonderful to meet others who are passionate about John Garfield. He was such a brilliant actor. Truly, he ought to be just as famous as Bogart, Gable, and all the rest. His story is so very tragic...dying so young, blacklisted because of HUAC, and then being largely forgotten and unappreciated. Though my blogathon is hardly a large-scale event, I am, nonetheless, thrilled for the opportunity to pay homage to Mr. Garfield on his centennial birthday. Thanks so much for stopping by. 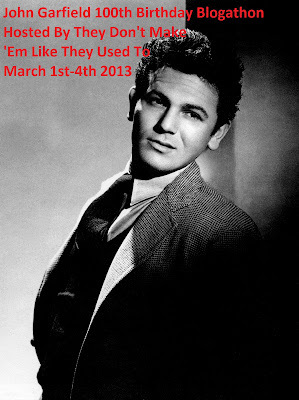 Be sure to visit on the 4 blogathon days...actually all through March, as he is my "man of the month." I will be following this blogothon religiously! It looks like it is gaining some serious enthusiasm from many well-respected writers!!! Sam, thanks for stopping by and for your interest in the blogathon. I'm always thrilled to meet someone else who recognizes and appreciates the incredible talent of John Garfield. I'm quite excited about the opportunity to have so many great bloggers sing his praises and give him and his films some much-deserved attention. This sounds like a terrific blog event and a wonderful tribute! May I take on THEY MADE ME A CRIMINAL? If that's not up for grabs, I'd love to write about HUMORESQUE or DESTINATION TOKYO. ND, thanks for wanting to get involved. You are more than welcome to participate. "Humoresque" and "They Made Me a Criminal" have both been claimed, but "Destination Tokyo" is available. It's yours if you want it! Patti...I was annoymous a few weeks ago...what is wrong with TCM...why dont they really give John Garfield a big 100th birthday bash?? If ever there was a an actor that deserves it he certainly does. I do know there are a few actors out there who like Garfield...like Mark Wahlberg....if only someone like him could get on the bandwagon and get this great actor re-discovered...I have been loved his acting for many many years...but i get so frustrated that he doesnt get his"due". Hope someday some produder will make a movies on Garfields life...that would be awesome!!! Anonymous, if I was the program director for TCM, John Garfield would have been "star of the month" for March, and I would have shown every single one of his 31 films!! I really don't understand why they (TCM) wouldn't want to make a big deal out of his 100th birthday. I mean, it's not like he was a mediocre actor. He was fantastic! That's readily apparent in any and all of his films. And it's not like his movies were crummy. Sure, as with any star, there were some films that weren't quite as great as others, but by and large, his filmography is filled with meaty, powerful films. So, I don't know why they don't give him more attention. As for current actors, producers, etc...I am almost positive that in the January issue of TCM's magazine, Martin Scorcese was raving about "The Breaking Point" (my favorite Garfield film). I've since pitched the magazine, so I can't verify that, but I'm pretty sure of it. So there you have a hugely successful modern-day director raving about a Garfield film. Wish Scorcese could do more to shine the spotlight on "our Julie." There are many wonderful blogs out there in blogland---and so little time to read them all. Therefore, I am truly humbled that you took the time to not only stop by my little place in the blogosphere, but to share your thoughts as well. Thank you for visiting...and for commenting. I hope your visit here was enjoyable and that you will return again soon. All photos on this blog have been obtained from various online sources, mostly Doctor Macro and Golden Age of Hollywood. I do not claim any photos as my own. To my knowledge, every photo used is in the public domain; however, if there are any copyrighted photos, I will take them down upon owner request.